A visit to the Hot Springs Farmers Market revealed a great surprise: newly picked Arkansas peaches! It’s the first crop of the season, and a week early. Today’s guests at Lookout Point enjoyed an appetizer of fresh Arkansas peaches, blueberries, topped with a splash of cream and mint sprig. Oh, the peaches are so sweet, with a heavenly fragrance. 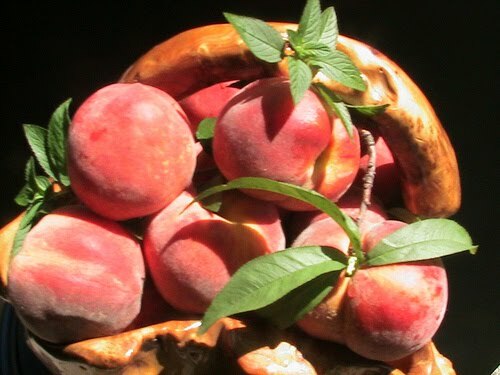 Not it’s time to make peach cobbler. The farmer from whom I bought the peaches joyfully provided his best recipe for Fresh Peach Cobbler. I made a batch, and it’s so easy and yummy. Enjoy! Melt butter in a 2 quart deep baking or casserole dish. In a small bowl combine sugar, flour, baking powder, satl, and milk. Whisk until well mixed. Pour this batter over the melted butter. Do not stir. Combine peaches with another 1/2 cup sugar (or less, if peaches are sweet). Spoon peaches over batter. Do not stir.